On Tuesday, the Westboro Baptist Church — also known as those wretched “God Hates Fags” people — protested Rancho Romero Elementary School in Alamo, California, for teaching students about gender equality and having a billboard promoting “gender diversity” created by a transgender student. A Westboro elementary school protest? Geez, the WBC is really losing its edge. 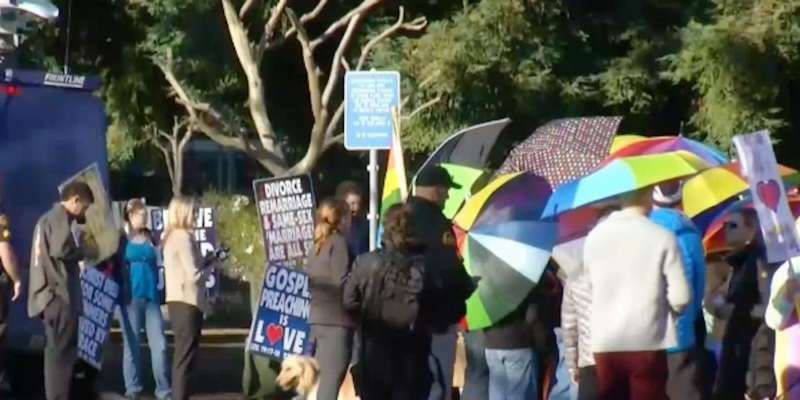 When the WBC’s protesters began their protest outside of the school at 8 a.m. Tuesday morning, they were met by parents and supporters who brought rainbow-colored umbrellas to block the WBC’s trademark day-glo signs with big fonts. The parents stood along the school’s chainlink fence so that elementary school students wouldn’t have to see signs reading “God Still Hates Fags” and such. The protest only lasted about 30 minutes, according to the NBC Bay Area affiliate. The bulletin board in question was reportedly posted back in January. It had information about gender stereotypes and was approved by a school committee that focuses on diversity and inclusion. Although one part of the board was initially considered questionable, according to Elizabeth Graswich with the Sam Ramon Unified School District, she says that part was revised within four hours with no complaints afterwards. CBS reporter Jessica Flores caught a small bit of the counter-protest on camera (footage below). 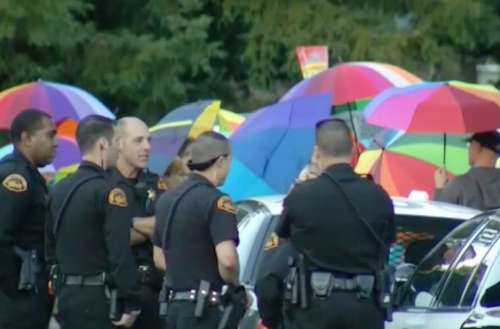 For a hate group that used to be really “edgy,” a 30-minute elementary school protest blocked by rainbow umbrellas seems pretty uninspired. Remember, this is the group that rose to infamy in 1998 for protesting the funeral of revered hate crime victim Matthew Shepard. 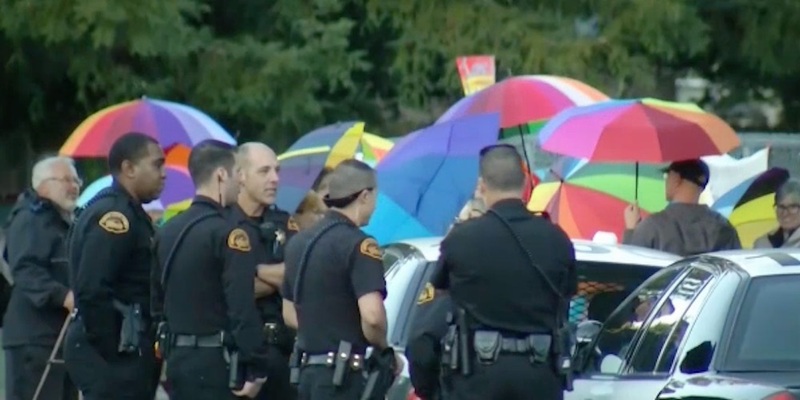 The church won a 2011 U.S. Supreme Court battle for the right to protest military funerals with signs reading “Thank God for 9/11” and “Fag Troops.” The Westboro Bpatist Church protested the Pulse nightclub after the 2016 shooting there. Now the WBC is protesting an elementary school over a bulletin board? Then again, in 2007 the WBC actually demonstrated outside an appliance store that sold Swedish vaccuums to protest Sweden’s prosecution of a vocal anti-gay priest. And in 2012, the church promised to protest the funerals of one of the elementary school kids killed at Sandy Hook, but chickened out when local bikers showed up to prevent them from protesting. Last year Hornet took out a billboard in Topeka, Kansas, near the WBC headquarters as part of our nationwide campaign against anti-LGBTQ hate groups. What do you think of this Westboro elementary school protest? Sound off in the comments.